Elon Musk’s underground transportation business, The Boring Company, has won a bid to create an underground high-speed rail line from downtown Chicago to O’Hare International Airport. The company beat out at least four other developers for the project, and Chicago Mayor Rahm Emanuel is expected to make an official announcement this afternoon. “We’re really excited to work with the Mayor and the City to bring this new high-speed public transportation system to Chicago!” the Boring Company said in a tweet shortly after midnight Eastern time. Unlike Musk’s much-hyped plan for a Hyperloop, this new proposal is for a slower system that Musk is simply calling Loop. If it’s actually built, Chicago’s Express Loop (not to be confused with the neighborhood of the same name) will take passengers the roughly 18 miles between downtown Chicago and O’Hare Airport in about 12 minutes. The existing above-ground Blue Line trains currently take about 40-45 minutes to travel that route. Both the mayor’s office and The Boring Company have reportedly declined to discuss how much the project will cost to build, but according to the Chicago Tribune, the Boring Company is footing the bill. For users, the rides are expected to cost between $20 and $25, according to the earliest estimates, which is roughly half the cost of an Uber. The L, Chicago’s elevated train system, currently costs $5 for the same trip. Musk has previously said that trips in Los Angeles using his new system could cost just $1. It’s not immediately clear why Chicago’s estimates are much higher. A timeline for the project has also not yet been announced. All that being said, everything could change in an instant. It’s too early to nail down exact prices and travel times, as everything is still conceptual and The Boring Company hasn’t built a working full-scale model just yet. So far the company has been digging tunnels under Los Angeles, which the company says are smaller than traditional tunnels for underground transportation, cutting down on costs. 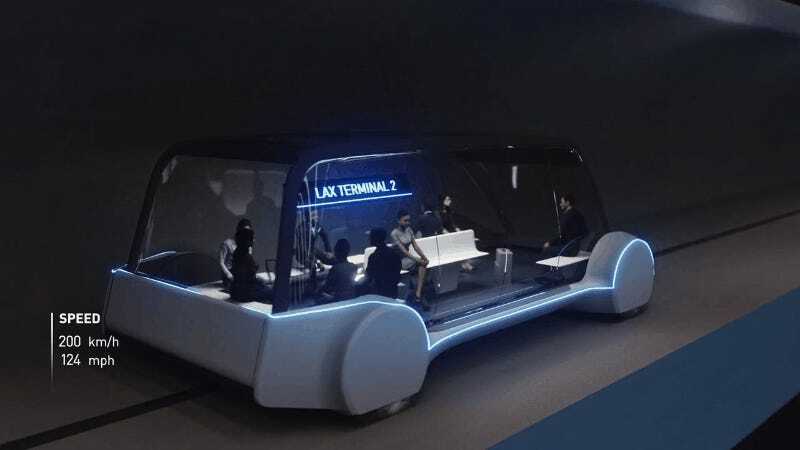 The Boring Company did produce a concept video for what its underground train service might look like three months ago, and the concept animation showed 16-passenger cars, much like the ones that are currently proposed for Chicago. But experts warn that things will likely change as they get down to the nitty-gritty of actually building this new underground system. “I suspect it’s going to evolve a few times before anything concrete gets done,” Hani Mahmassani, a professor of engineering at Northwestern University, told Bloomberg News. The current concept vehicles are zero-emission and would run on Tesla batteries while sliding on rails. Musk has used the term “skate” to describe how the vehicles would move. The company says that each vehicle would be equipped with a climate-controlled cabin, which is particularly necessary for Chicago’s brutally cold winters and muggy summers, as well as luggage storage space, and even Wi-Fi. The Boring Company insists that it won’t have to deal with land rights on any major scale since it’s tunneling below the city, though it will have to secure rights for the stations. Last month, Musk told an audience in Los Angeles that stations for that city wouldn’t be much larger than a parking space. The company hasn’t released any information yet about how big the footprint for Chicago’s Loop system stations might have to be, though judging by the concept art, it would be considerably larger than a parking space. Today’s press conference will reportedly be held at Block 37, a failed transit superstation that was foreclosed on in 2011. The site currently has residential apartments, retail stores, and an AMC movie theater, but its transportation areas are dormant. Billionaire Elon Musk, who also founded the car company Tesla and the space exploration company SpaceX, came under fire (sorry) last week when The Boring Company released a flamethrower of questionable social value. The device, literally called Not-A-Flamethrower, is idiotic, to say the least. But Musk’s press conference with Mayor Emanuel later this afternoon will no doubt be an effort to change that image into one of an altruistic capitalist bringing efficient transportation to a city plagued by traffic congestion. Musk has sparred with the press lately, but the billionaire tech titan can expect to be flooded with positive news today as his sleek new concept for urban transportation gets one step closer to reality. Update, 2:05pm: Elon Musk and Mayor Emanuel’s joint press conference starts at 2:30pm ET/1:30pm CT. You can watch the livestream here. Update, 2:45pm: “It will take longer to get through security at O’Hare than to get to O’Hare,” Mayor Rahm Emanuel says at the press conference. Emanuel presented Elon Musk with a flag of Chicago and asked Musk to hang it in his office. Musk emphasized that Chicago is a great place to do business because there aren’t too many regulatory bodies to deal with. Musk also talked about the possibility that they might do pre-check for airport security at the station in downtown Chicago. A reporter asked where the financing for the project will be coming from. “I don’t really have much trouble raising money,” Musk said to laughs in the crowd. Musk says that the goal is to be operational within 16-24 months, though it’s possible that it could take three years.